While the cricketing world was going nuts for young Aussie leg-spinner Lloyd Pope last week, a teenage pace-bowler from Cranebrook was putting on a scintillating show of her own. 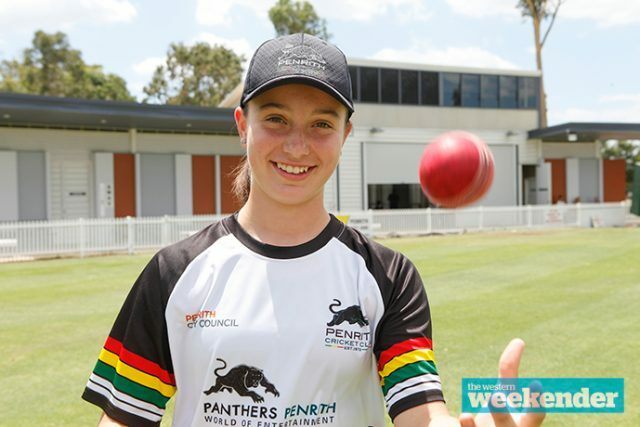 Playing in a One Day Match for Penrith against Manly-Warringah in the Brewer Shield (U17 division) competition, 13-year-old Maddison Sullivan had herself a performance that will be remembered for a very long time. In fact Maddison – and everyone present at Weldon Oval on January 21 – will never forget the feats of that hot summer’s day. The Year 9 Xavier College student, who has only been playing cricket for three years, recorded an unbelievable 9/13 with the ball. Maddison’s incredible performance was acknowledged as the best bowling figure in the country that weekend – and boy it’ll take something ‘out of this world’ to go past it anytime soon. What made Maddison’s efforts that bit more absurd (in case it wasn’t already) was the fact she did it in 5.5 overs, and against some players three to four years her senior. Speaking with the Weekender, Maddison said she could hardly contain herself as each wicket continued to fall and fall and fall. “The game started just like any other and then I just started taking all these wickets,” she recalled. Funnily enough Maddison almost did single handedly dismiss the whole Manly-Warringah line-up one by one. “I was bowling when the run-out occurred but that wicket got credited to the fielder,” Maddison said. Making the win extra special was the fact it was Penrith’s first victory of the season following four straight defeats. Maddison said it was an all-round great team performance with batter Elsa Hunter recording a team-high 70 runs. While she knows taking nine scalps in a single innings is extremely rare, Maddison is hoping to continue her dominance with ball as she progresses through the grades.